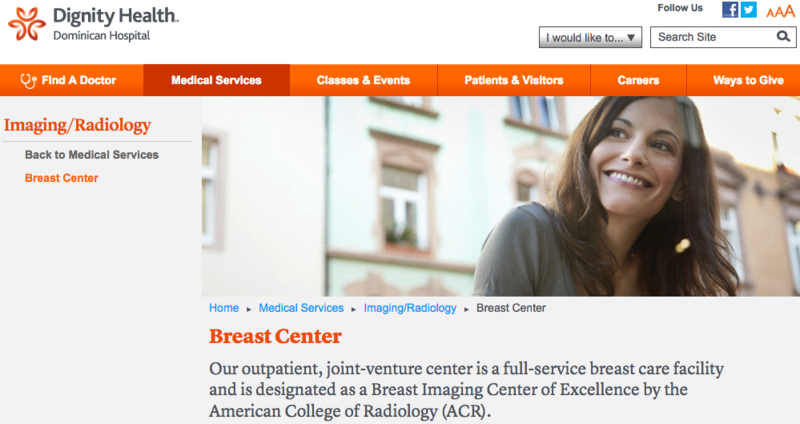 SANTA CRUZ, Calif. – The Dominican Breast Center, a joint venture between Dignity Health Dominican Hospital and Radiology Medical Group of Santa Cruz County, now offers 3D mammography, or tomosynthesis, for the detection of breast cancer. The Dominican Breast Center is the only medical facility in Santa Cruz County delivering , the latest advancement in mammogram technology. During tomosynthesis exams, an X-ray tube moves in an arc around the breast to produce digital images from multiple angles. This technique provides a clearer depiction of breast tissue compared to standard 2D mammography and, for most patients, the entire process takes approximately 10 minutes. The technology has been shown to decrease the number of false-positive mammograms by revealing that possible abnormalities are actually the overlapping of normal tissue. This results in fewer women called back to undergo additional imaging, decreasing patient anxiety and inconvenience. Tomosynthesis is a particular advantage for the 40 percent of women with dense breast tissue. It can find small cancers and better define larger tumors that may be obscured by dense tissue on conventional 2D mammograms. The Dominican Breast Center has been designated a Breast Imaging Center of Excellence by the American College of Radiology (ACR). For more information about the Dominican Breast Center and 3D tomosynthesis mammography, visit www.dignityhealth.org/dominican/medical-services/imaging-radiology/breast-center.